BSQ has been on the D.C. scene for ten years, devoted to straight-ahead jazz, from duos to sextets, and vocals by Nina Schwartz. 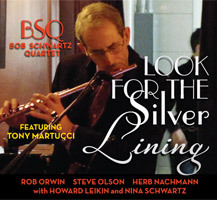 The emphasis is on bop and swing, lesser known standards in each genre, and original compositions by leader Bob Schwartz. BSQ is a regular attraction at D.C. area jazz clubs, lounges, restaurant and hotel venues, and private events. BSQ CDs, downloads, and streams are available at CD Baby, Amazon MP3, iTunes, and several streaming services. For current bookings, please follow (“like”) us on our Facebook page. Please send us an email if you’d like to be on our mailing list.